Wii U Zelda: Tech demo or new game? As part of the demo for the newly named Wii U home console, Nintendo showed off some very impressive-looking footage of a possible future Zelda game. The graphics look too stylized to be a simple port of Skyward Sword, but too simple for a re-release of Twilight Princess or any other recent games. It’s unknown whether this footage is a simple tech demo, put together to show off what the Wii U is capable of, or footage for a Zelda game we could be seeing in future. The footage shows a battle between Link and Queen Gohma, as well as a quick shot of the Wii U’s touchscreen controller being utilized as an item screen. Hit the jump to view the video for yourself! 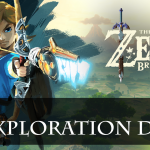 Do you think Nintendo will be announcing this as a brand new Zelda game created for the Wii U, or is it just a simple tech demo put together to show off what the system can do? Let us know your thoughts in the comments.